Yes, we re-arranged the living room. I was sick of everyone coming into my office whenever I was at my drawing table so I brought my table to them. 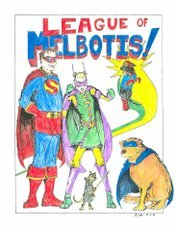 From 2003 until 2009, League of Melbotis welcomed all like-minded individuals willing to use their unique abilities for the betterment of mankind. The blog covered pop-culture with an emphasis on comics and super-heroes. It also talked a lot about the beloved pets of League HQ. "Melbotis" was a 100 lb. Golden Retriever who passed in January 2009. He was the best dog ever. The final chapter closed on this blog in December 2009. You may still contact the blog's author. This is a Flickr badge showing public items from RSteans tagged with cr_league. Make your own badge here.